Two much-loved titans of rugby are put on stage- dramatised is not quite the right word. The productions tour simultaneously so that on a chilly Friday night in March they are playing to audiences just fifteen miles apart. The design, a dressing room, is the same. The productions are different in scope, and budget, but their coincidence of timing and subject makes it inevitable that they put themselves up for comparison. The critics from England have given the larger production a thumbs-up, ranging from the positive to the ecstatic. That is good for all concerned- Sherman Cymru and London’s Arcola are production partners- as it has months of touring ahead of it. Sam Marlowe of the Times is a critic to be reckoned with and five stars is a mighty endorsement. That it has an aching sincerity to it is undeniable, but sincerity is in itself not an end destination. “Grav” is the stronger piece, stronger because it is more theatrical. Take design. The dressing room in “Crouch, Touch, Pause, Engage” is a prop with benches and hooks for the frequent costume changes. It serves its functions but Francis Bradshaw’s set for “Grav” is a creation of vivid detail. Gareth Bale’s Ray Gravell tentatively enters a room of stained tiles, grimy windows, rusted lockers and in-growing ivy. He jumps at the sparks issued by a shorting bulb. “Grav” has rhythmic and tonal variation some way beyond the larger production. This is in part because it includes a sound design but largely courtesy of the fact that the script is in the hands of an imaginative re-creator. A bus is described as being of such slowness as to be “like some asthmatic snail”. This may not be authentic in a documentary sense but it is vivid. Language for performance has never been the language of the everyday. Most of all “Grav” takes its audience into its world of rugby. The physicality is there, how it is be “facing a charging eighteen stone South African”. The sound design uses off-stage crowd song to evoke the stadium. But Owen Thomas also captures some of the inner spirit and camaraderie. A couple of eggs are cracked into a glass and it is called lunch. A fellow star player makes Gravell fret over the possibility of a creeping belly. Because Owen Thomas is able to use humour he can also take his audience into moments of poetry. 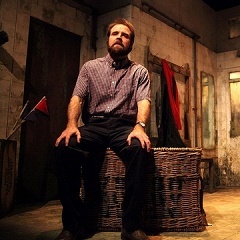 Glyndwr and Gwenllian are evoked and the production creates a genuine poignancy for Grav’s last exit. “Grav” has done well. Audiences do not gather by accident. Little Theatr Felinfach is heaving- there are a half dozen seats unfilled out of its two hundred and sixty-three- and the atmosphere of a collective coming together is tremendous. A little audience questioning reveals that the Torch has done its marketing astutely, matching media to its audience. Out of Joint’s productions of 2008, 2010 and 2012 have all been reviewed on this site to acclaim. The company’s necessity for a joint venture was set on 30th March 2011 when its funders reduced its grant by twenty percent. “Crouch…” has had a long gestation with Bridgend workshops, recorded in Max Stafford-Clark’s “Journal of the Plague Year”, taking place in June 2012. In the meantime Rhys Waters and Nathan Mackintosh have made their documentary “Gareth Thomas Game Changer” for Zipline Creative/ BBC Cymru Wales. With the player himself, his parents, best friend and team-mates speaking direct to camera their film has an immediacy and emotional kick that no actor can match. It also ends with scenes of an achieved warmth of middle age cohabitation completing the arc of the story where the theatre piece does not. That very best of theatre critics, Lyn Gardner, has written of “performances that seem simply designed to confirm everything we already know about the world and ourselves.” Like “Little Revolution” last year, Alecky Blythe’s attempt to portray the London Riots in theatre, “Crouch…” would have been stronger- and outgunned television- by getting into the minds of the other side. The player was caught in a three way nexus. The hacks do what they do and are familiar. But the world of rugby, whose rituals take in the eating of cat food or sheep’s brains, is little touched upon. The inner torment was solely caused by the environment- in scores of other livelihoods sexuality has been a non-issue for decades. Theatrically it would have got its power by getting into the minds of the watchers screeching their homophobic abuse. Instead the structure- and this was set back in 2012 at the beginning- incorporates two teenagers- for “Bridgend” read “suicides”. The mental torment of young people is a topic of gravity all of its own. Ironically their scenes are the most enlivened but their principal function is to lay the ground for a feelgood ending. It is a function that regrettably jars badly with the experience of this reviewer. “Grav” scores, because it doesn’t want to be documentary. It wants to be theatre and that makes it real.